This example shows how to apply the shorthand regARIMA(p,D,q) syntax to specify the regression model with ARMA errors. Description: "ARMA(3,2) Error Model (Gaussian Distribution)"
The software sets each parameter to NaN, and the innovation distribution to Gaussian. The AR coefficients are at lags 1 through 3, and the MA coefficients are at lags 1 and 2. Pass Mdl into estimate with data to estimate the parameters set to NaN. The regARIMA model sets Beta to  and does not display it. If you pass a matrix of predictors (Xt) into estimate, then estimate estimates Beta. The estimate function infers the number of regression coefficients in Beta from the number of columns in Xt. Tasks such as simulation and forecasting using simulate and forecast do not accept models with at least one NaN for a parameter value. Use dot notation to modify parameter values. This example shows how to specify a regression model with ARMA errors without a regression intercept. The software sets Intercept to 0, but all other parameters in Mdl are NaN values by default. Since Intercept is not a NaN, it is an equality constraint during estimation. In other words, if you pass Mdl and data into estimate, then estimate sets Intercept to 0 during estimation. You can modify the properties of Mdl using dot notation. This example shows how to specify a regression model with ARMA errors, where the nonzero ARMA terms are at nonconsecutive lags. Description: "ARMA(8,4) Error Model (Gaussian Distribution)"
The AR coefficients are at lags 1, 4, and 8, and the MA coefficients are at lags 1 and 4. The software sets the interim lags to 0. Pass Mdl and data into estimate. The software estimates all parameters that have the value NaN. Then estimate holds all interim lag coefficients to 0 during estimation. This example shows how to specify values for all parameters of a regression model with ARMA errors. where εt is Gaussian with unit variance. Description: "Regression with ARMA(3,2) Error Model (Gaussian Distribution)"
The parameters in Mdl do not contain NaN values, and therefore there is no need to estimate Mdl using estimate. However, you can simulate or forecast responses from Mdl using simulate or forecast. This example shows how to set the innovation distribution of a regression model with ARMA errors to a t distribution. where εt has a t distribution with the default degrees of freedom and unit variance. Description: "Regression with ARMA(3,2) Error Model (t Distribution)"
The default degrees of freedom is NaN. If you don't know the degrees of freedom, then you can estimate it by passing Mdl and the data to estimate. You can simulate or forecast responses from Mdl using simulate or forecast because Mdl is completely specified. In applications, such as simulation, the software normalizes the random t innovations. In other words, Variance overrides the theoretical variance of the t random variable (which is DoF/(DoF - 2)), but preserves the kurtosis of the distribution. 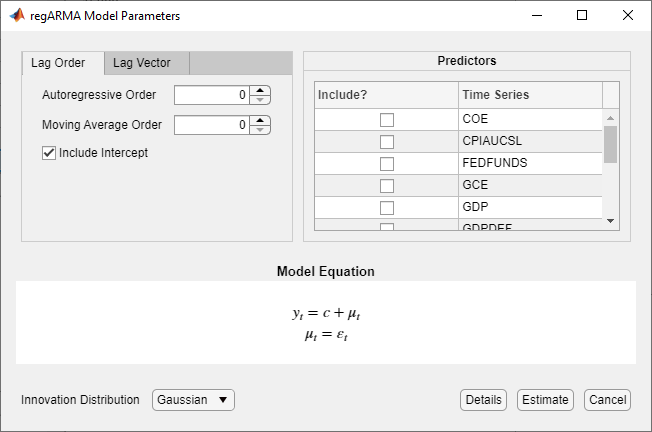 In the Econometric Modeler app, you can specify the predictor variables in the regression component, and the error model lag structure and innovation distribution of a regression model with ARMA(p,q) errors, by following these steps. All specified coefficients are unknown but estimable parameters. In the Data Browser, select the response time series to which the model will be fit. In the models gallery, in the Regression Models section, click RegARMA. The RegARMA Model Parameters dialog box appears. Choose the error model lag structure. 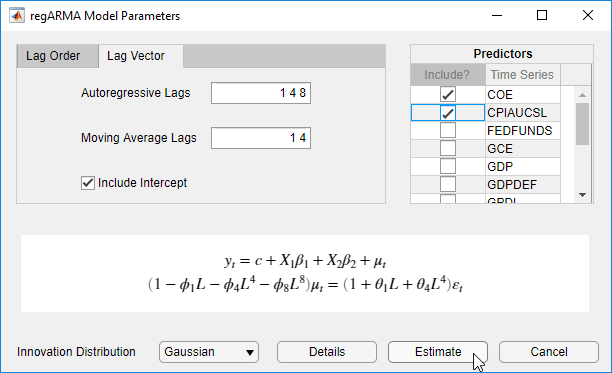 To specify a regression model with ARMA(p,q) errors that includes all AR lags from 1 through p and all MA lags from 1 through q, use the Lag Order tab. For the flexibility to specify the inclusion of particular lags, use the Lag Vector tab. For more details, see Specifying Lag Operator Polynomials Interactively. Regardless of the tab you use, you can verify the model form by inspecting the equation in the Model Equation section. In the Predictors section, choose at least one predictor variable by selecting the Include? check box for the time series. For example, suppose you are working with the Data_USEconModel.mat data set and its variables are listed in the Data Browser. In the Data Browser, select the UNRATE time series. In the regARMA Model Parameters dialog box, on the Lag Order tab, set Autoregressive Order to 3. In the Predictors section, select the Include? 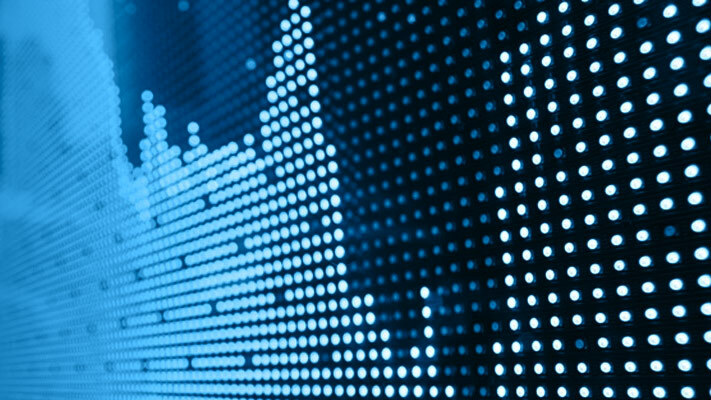 check box for the COE, CPIAUCSL, FEDFUNDS, and GDP time series. To specify a regression model with MA(2) errors for the unemployment rate containing all MA lags from 1 through its order, Gaussian-distributed innovations, and the predictor variables COE and CPIAUCSL. In the regARMA Model Parameters dialog box, on the Lag Order tab, set Moving Average Order to 2. In the Predictors section, select the Include? check box for the COE and CPIAUCSL time series. In the Autoregressive Lags box, type 1 4 8. In the Moving Average Lags box, type 1 4. Set Autoregressive Order to 3. Set Moving Average Order to 2. The degrees of freedom parameter of the t distribution is an unknown but estimable parameter. After you specify a model, click Estimate to estimate all unknown parameters in the model.